breakfast | Hot vegan chick.....peas! On a recent episode of the America’s Test Kitchen podcast the host interviewed the author of The Drunken Botanist, a book about all the different ways plants, flowers, fruits, and herbs have been incorporated into alcoholic drinks. 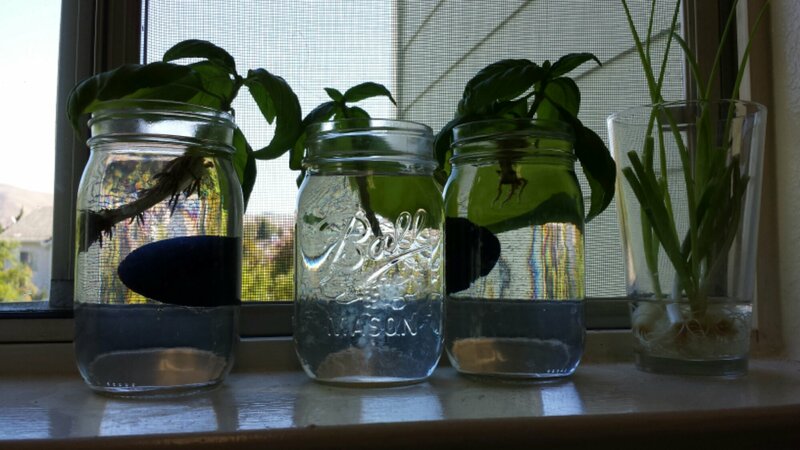 Basil was mentioned in particular, so I started to think about what sorts of interesting drinks I could make from my own overgrown basil plant. Strawberry and basil is one of those combinations that I saw once in a cookbook (gazpacho shooters in The Inspired Vegan) and then started noticing it popping up all over the place, like in cocktails, lemonade, tarts, and preserves. I don’t know if it’s trendy right now or if I’m just more alert, but it sounded sounded cool and refreshing, which is perfect since it’s super crazy hot here right now!! I opted for a smoothie since it was a bit too early to get boozy and I had a lot of soy yogurt in the fridge. I don’t really have a recipe, I just kind of threw together yogurt, fresh strawberries, basil, frozen pineapple chunks (for bulk), a few ice cubes, and some maple syrup. I made separate basil and strawberry smoothies because I didn’t want the end product be be an ugly brown! They sort of layered ok but the strawberry mix was much denser than the basil mix so it didn’t work out as well as I had hoped. I really enjoyed this smoothie but Mr. HVC….not so much! 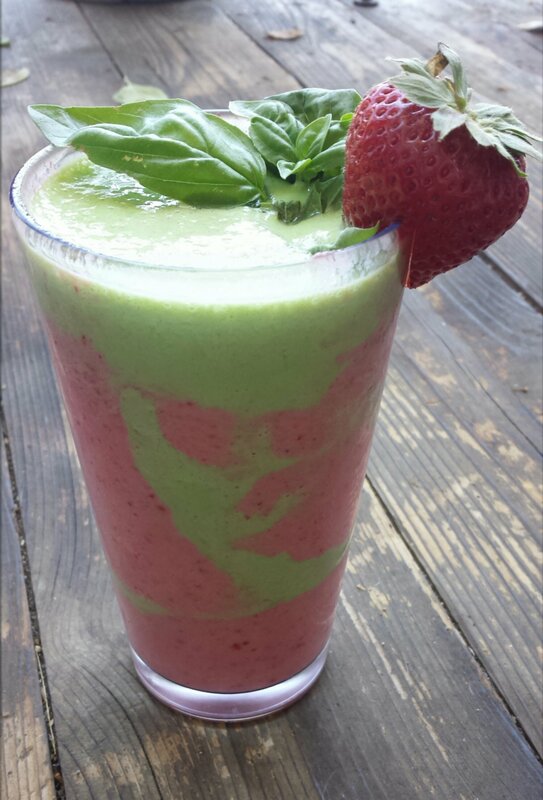 I relied mostly on the natural sweetness of the strawberries because a super sweet basil smoothie didn’t sound very appealing! I think the tartness of the yogurt also helped out a lot. I loved the flavor but I think it’s one of those things that you might not want to try if you’re less adventurous. 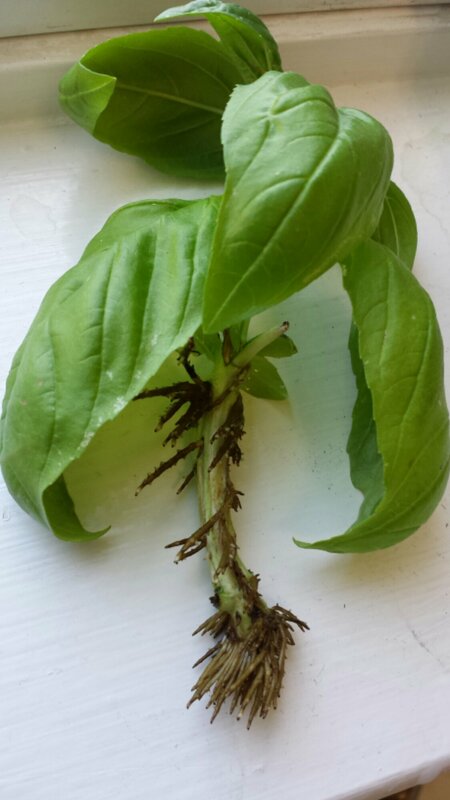 It took me a while to get over the expectation that basil is only good in savory applications! It was super cool and refreshing though, which was exactly what I needed on a 90 °F morning! I looooove avocado, as in I eat them almost every single day. I feel like I pretty much have to…I grew up next to the “Avocado Capital of the World” so avocado culture was a big part of my life! My dad even had his own little avocado grove in my childhood home; when my parents moved to Washington state a few years ago he was so sad to leave them behind. After tending them for so many years (they’re very finicky trees!) they’d become a part of the family. Now I have my own fledgling forest that I’ve started from the pits of my daily avo and a few have grown big enough that they’re ready to be grafted. I’m so excited! With that in mind, I’m pretty surprised I’d never heard of avocado toast until I saw a recipe for it in Chloe’s Kitchen. Then I started seeing people talking about it everywhere! While I don’t really think avocado toast warrants its own recipe in a cookbook, I’ve fallen in love with the stuff and have been playing around with variations. 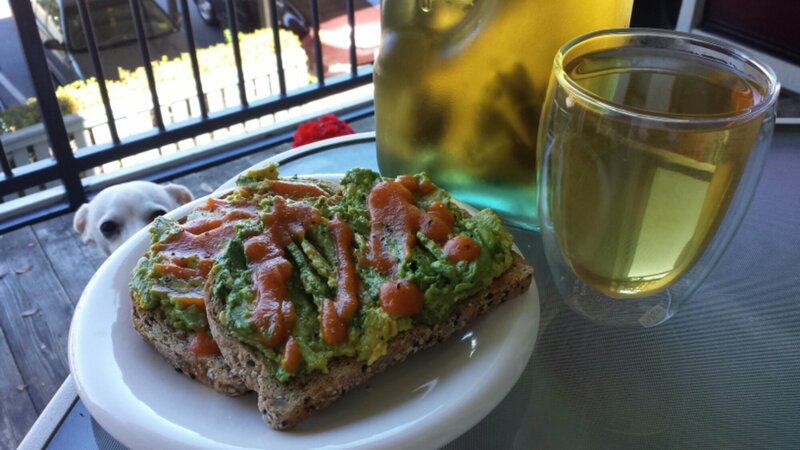 My favorite way to eat avocado toast is mashed up on Dave’s Killer Bread (best bread evar!) with salt and freshly ground pepper and a drizzle of carrot habanero hot sauce from Tart and Sweet. It’s crunchy, creamy, rich, and spicy — so many flavors going on for such an easy breakfast! On weekends I like to sit out on my balcony with Rhodie and enjoy it with some iced chamomile tea. 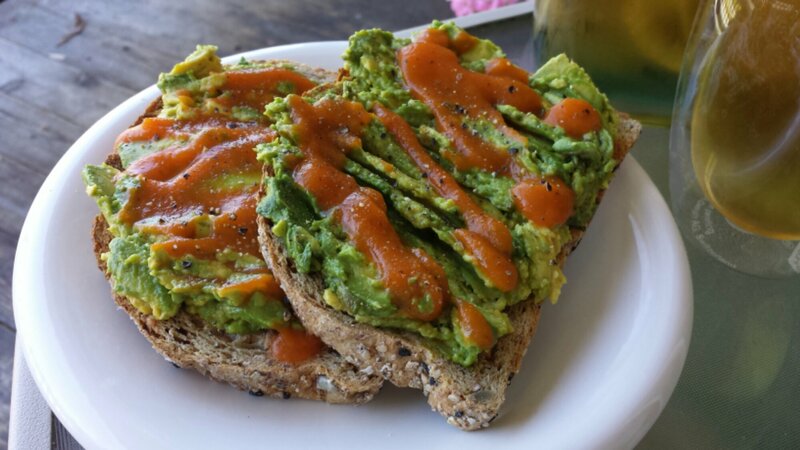 Oh avocado and toast, you are my favorites. I’m constantly amazed by the recipe ideas I find online and the fact that I’m the millionth person to think of them (and also that so many recipes are vegan without me including “vegan” in my search term. Yay vegan bloggers!)! 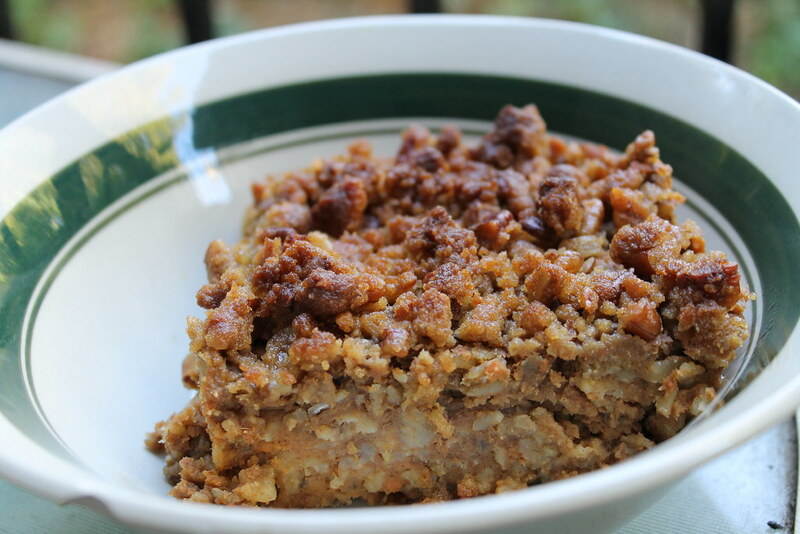 I had a sweet potato, bananas, and oatmeal at home and thought I would make some kind of healthy baked oatmeal casserole to incorporate them all. Well, googling that will bring up a ton of hits and I decided to try this one from Oh She Glows. I pureed the sweet potato and banana so that the filling (which includes oats, chia seeds, soy milk, maple syrup, and spices) would be nice and creamy. 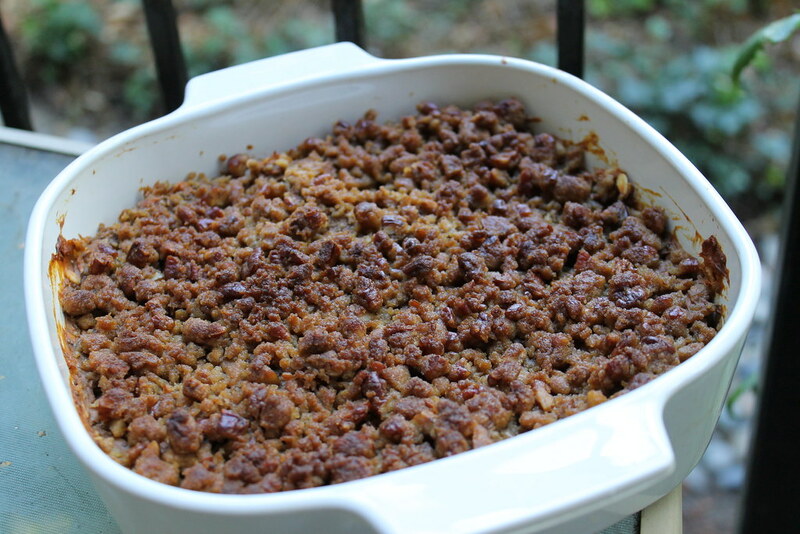 It’s topped with a pecan crumble that is absolutely delicious. I thought it was a perfect fall breakfast treat; Mr. Chickpea thought the filling should be sweeter (more like a dessert!) and thought nuts mixed in to the filling would be really good. Happy week 2 of MoFo 2012! My trip to Farm Sanctuary was amazing, and I’ll talk more about it in my post this Sunday. So, it’s back to breakfasts here on HVCP, and this week I was looking for a smoothie with lots of fall flavors. I started my smoothie obsession this summer when it was too hot for my normal tea and muffin. I’m not a big breakfast person so it’s been a real treat to mindlessly slurp down some liquid nutrition on my way into work! 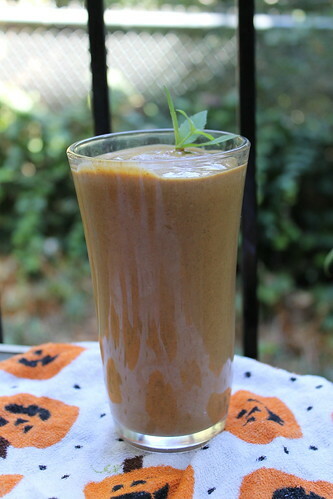 I wanted to try something pumpkin-y for today and there are tons and tons of recipes for pumpkin pie smoothies online, so clearly this is a genius idea! The recipe on Oh She Glows looked really good but I had forgotten to soak oats & chia the night before so I subbed in some soy yogurt but otherwise followed the recipe. The yogurt made it a bit more tart than I would like, so I want to try again with the oats, but overall it was really good! 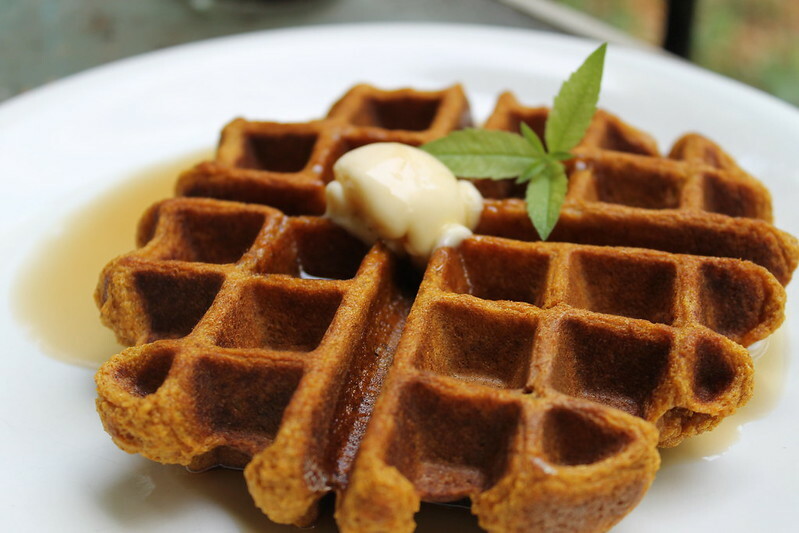 Lots of pumpkin goodness and super filling. 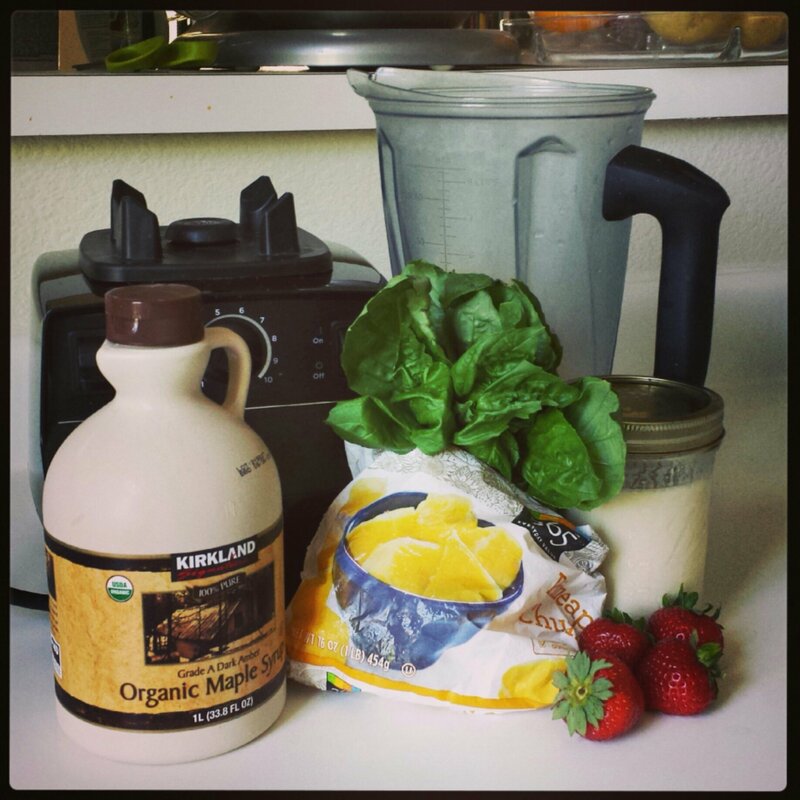 What are your favorite fall smoothies? Next up on my list is something with ginger! I had the best tofu scramble on a recent road trip — everything was cubed, so it was more like a stir fry in my opinion, but it’s amazing regardless and I did my best to recreate it. 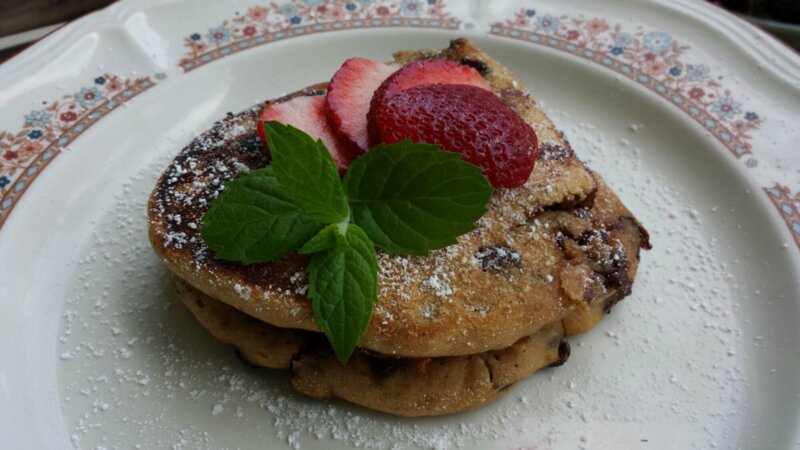 Sweet and savory, it’s great with toast and hash browns or in a breakfast burrito. Here’s an approximation of the the recipe I follow, though you can adjust or change the spices. Toss the yams in some olive oil and bake at 400 F until softened but still slightly firm. Set aside. Toss the tofu in some soy sauce or teriyaki sauce (or no sauce, if yiu prefer) and bake at 400 F until firm and chewy. Sauté red bell pepper and mushrooms in a pan with olive oil and a little salt, until softened. Add spices and garlic and sauté 1 min. Add potatoes and tofu to pan, warming through. Add scallions and stir till softened. Season to taste. Serve and enjoy!